Mona Lisa by Leonardo da Vinci is the most famous painting of the Musée du Louvre in Paris. Everyday thousands of viewers were mesmerized by her smile. On extremely busy days, the museum staff steadily ushers viewers past the painting in order to keep the crowds moving at a steady pace. Therefore if you have visualized yourself standing in front of Mona Lisa for hours while contemplating the meaning behind her smile, you would be disappointed. In fact, pausing in front of her is often not permitted because it interferes with crowd control. Have you, like me, wondered how Mona Lisa managed to keep the same smiling face for days that presumably would have taken Leonardo Da Vinci to finish the painting? What was her inner experience during the time of da Vinci’s artistic creation? And where lies the art of da Vinci, I mean presumably the painting was not just an exact recreation of nature - which can be done much better with today’s photographic technology. Today, we usually don’t have the experience or luxury of having a painter to paint a portrait for us. When we took pictures for our passport or other photo IDs, we delivered a blank look, trying to conceal any possible inner emotion, lest our inner self might be revealed to an official who might look at it with suspicious eyes one day, our jet-lagged smile might just be interpreted as concealing some sinister secret. And therefore most ID pictures look unattractive and we don’t want to show them to our friends. When we take casual pictures, like during Christmas parties, we try to deliver the best impression and try to immortalize it onto the mind of future viewers of our picture. I noticed most of my friends’ smile on their social pictures almost look exactly the same, irrespective of the setting, occasion, environment or the mood when he or she was taking the picture. We conceal and we deliver what we believe to be our best image. And some will be proud to tell you that “I look much prettier on camera!” or "People say I'm photogenic" And the speaker will be happy. Which statement can be translated as “I can deliver the best of me when someone takes a picture of me.” And seemingly we have all turned into a modern day Mona Lisa with our best smiling faces. Or is it so? 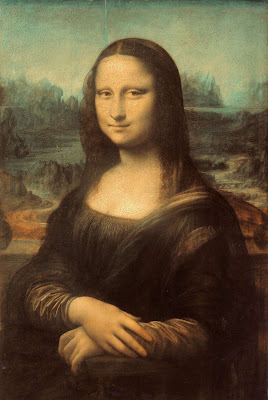 Let's speculate a bit on the psychology of Mona Lisa. Assuming that we share the same human psychology, I would say that the facial expression of Mona Lisa would have continual subtle changes through the days when her portrait was being painted. She would most likely be fresher in the morning, getting a bit restless as the hours pass, perhaps pondering about the chores on next evening’s dinner when some important guests would be coming over for a casual meal, day-dreaming for nothing in particular…etc etc. What was in her mind at that particular moment would have affected her facial expression subtly. And such subtleties most likely couldn't escape the discerning eyes of the artist. The more the artist could empathize with his human subject as a living passionate person, the more information he would get, and the more likely he would be confused as to how to paint just one image instead of the many images that have impressed on him. The personal rapport between the artist and his subject is very important for the artistic creation process. Fair to say when a painter/artist did painting job for a fee, he really had no choice, he had to do it good no matter whether he could stir up creative rapport with his human subject. He had to do it right, and better yet, his human subject would like to have himself or herself “Look prettier on canvas”, like our modern photogenic neighbors! In order to do create something as lasting as the Mona Lisa painting, something more must be there. In my previous post “Look at your loved one the Picasso way”, I discussed Picasso’s approach on seeing and drawing his loved ones. For one thing, Picasso was not selling portraits, and therefore he could have the freedom to choose an artistic technique that he believed could fully deliver his passion towards his human subject. Working within his constraint of having to deliver a good looking realistic portrait, da Vinci had to deliver everything with only one singular perspective. And our painter/artist had to capture every emotion and passion he had with his human subject and deliver it with one singular expression. A facial expression not of a single fleeting moment that will better be captured by a modern camera, but facial expression that captures the eternity of the artist’s passion towards his human subject, recreated through his brushes on canvas. And that makes the true art of the Mona Lisa painting, same for Leonardo da Vinci, same for other artists doing realistic human portraits.